Instagram is such a powerful tool that it can take your blogging career to sky high levels. Therefore, I take time for you to sum up all the important knowledge I gathered throughout my Instagram experience. One lesson I learned is that you should treat your Instagram same way as your blog. Today I give your 5 tips ‘how to get more Instagram followers‘. Try to post at least once a day, just to let the Instagram world knows your still exist. My personal experience is when you post 2 or 3 pictures a day your following will grow faster. But I admit, posting 2 a 3 pictures is hard to manage. You really have to figure out what works best for you. Make sure that you post on a regular basis. What I mean, try to post everyday around the same time. When are your followers active? Figure out which hour of the day you will get more likes or comments. This way your followers know when to expect a post from you. Please don’t post more than 3 pictures a day. If you overwhelm your followers with a lot of selfles or flat-lays they will see you as a spammer. The button will be not green anymore! When you want to grow your audience, it’s really important to be active. Interact with your followers, like their pictures and give mean full comments. This way you will create interaction and improve your engagement. This would be more important than the number of following. Engagement is the key and will make it more fun. When you get a lot of likes or comments on a picture it will trigger you to improve yourself with better pictures. Beside that by commenting and liking it will help you get noticed! Including relevant hashtags in your captions will help your posts appear to people who may not already be following you, but are searching for photos related to your brand on industry. Find out which hashtags are popular and is relevant with your post, but don’t go overboard. Using too many hashtags can be distracting for your audience and dilute your message. Oh and please don’t use hashtags such as #likeforlikes, #followme or #tagsforlikes. It may help you see a temporary increase in new followers, but they may be only be spammers or people only interested in being followed back. This will not help you build a meaningful engagement. So a NO GO! Ask questions: This will encourage your audience to leave a comment with their answer, and this type of engagement will help make your account visible to more people. Tag your location: People at the same place will notice your post, which can help expose your Instagram account. Tag users: Tag other Instagram users featured in your photos either in your caption or by using Instagram’s tagging functionality. Encourage your followers to tag their friends in the comments if applicable. 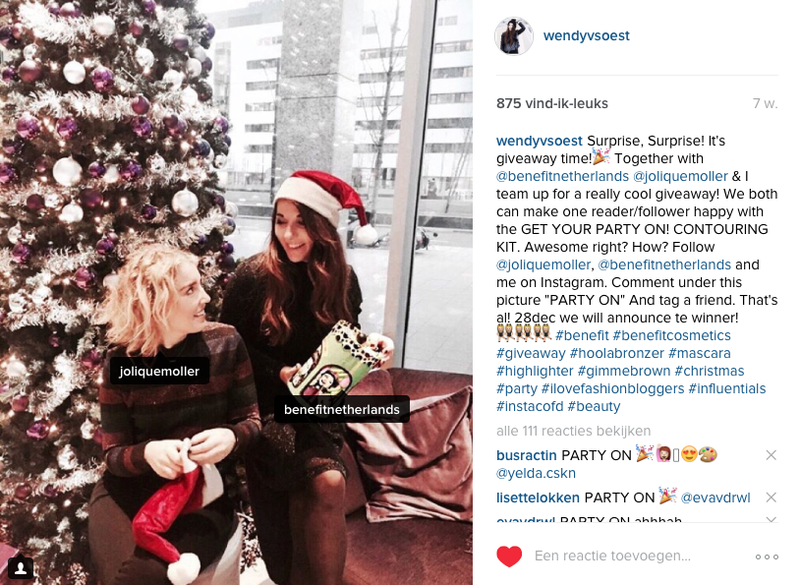 For example: I did a giveaway with Benefit and one of the rules was to tag a friend. This can help expose your Instagram account to a larger network of people. When you are with your blogger buddies, make sure to tag each other in your Instagram pictures. This way you will help each other get noticed by each other followers. Hello new followers! Well let’s start today with improving your Instagram account! Goede tips van een Instagram kei zoals jou. Hey wat leuk om mezelf hier boven op jouw foto te zien, haha! sabine onlangs geplaatst…So far… So Sabine; Thank you! alexa onlangs geplaatst…Thailand, here I come! Awesome article with tips that will come in handy!! <3 Great work putting this together!! Loved it!! Tips | Who says V-day is for couples?